New York: Penguin Press, 2014. First edition of this “dazzling and instructive work” (Walter Isaacson). Octavo, original boards. 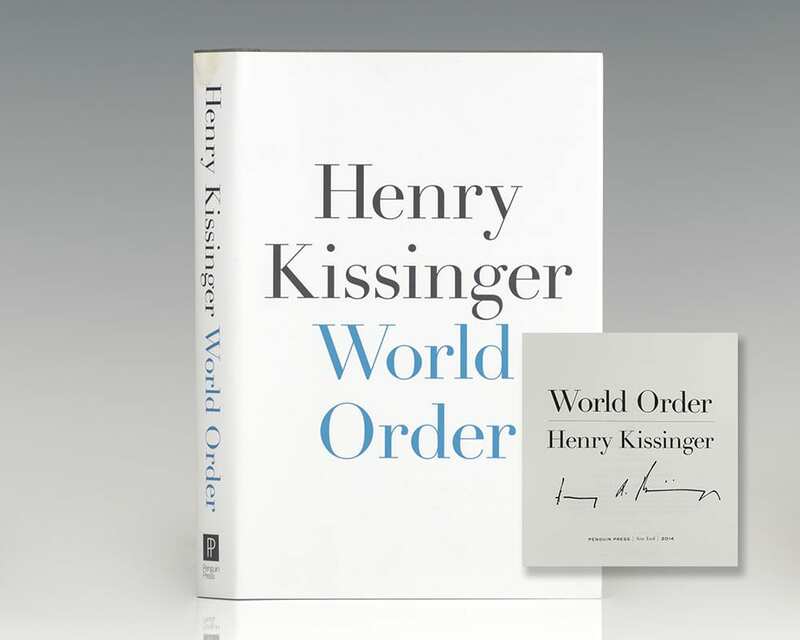 Boldly signed by Henry Kissinger on the title page. Fine in fine dust jacket. Jacket design by Darren Haggar. Chile: The Crime of Resistance. Surrey, England: Foreign Affairs Publishing Company, 1983. First edition of Chile: The Crime of Resistance. Octavo, original cloth. Inscribed by the author on the half title page to Henry Kissingers, “A Henri Kissingers Secretaire d’Etat hommage respectueux, Suzanne Labin le Paris 12.3.83.” A nice association linking Labin, a provocative anti-Communist French analyst and Kissinger, a pro-Pinochet supporter. Labin portrays a Chile that vindicates Kissinger’s policies — Allende was the oppressor and Pinochet a beacon of progress according to Labin.